This was an interesting project, as our customer wanted a much improved bathroom and the existing bathroom just wasn’t big enough. 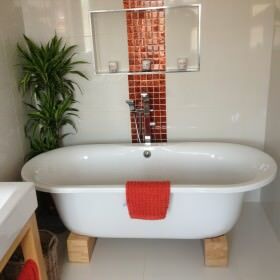 We worked with them to design the new bathroom, which involved increasing the floor space by knocking through the wall into the bedroom and rebuilding to take as little space from the bedroom as possible, but making sure there was enough room for a stunning new bathroom. Our client sourced the bathroom furniture themselves (and the tropical plant!) and we did the rest, including the tiling. As you can imagine, being without the main bathroom for a few days could be quite an inconvenience, however, in this case it wasn’t a problem as the client had a cunning plan, as Baldrick would say! They had a small downstairs toilet which was also being used to house the washing machine. It was a bit of a mess and for some time they had been thinking of sorting it out and having it turned into a proper wet room. Now was that time! And the genius of it was that by doing this ahead of the work on the upstairs bathroom, the family would still have a working bathroom, complete with shower. It was a relatively straight forward task, other than the fact someone else had already attempted to lower the concrete floor in preparation for a new wet room, but had not done a very good job of it, which made our job harder. We re-formed and screeded the floor, incorporating the new floor gully and correct fall. We also had to sort out the plumbing fitments, which included removing and re-running lots of surface mounted pipe work so none of this would be seen once the new shower room was complete. We plumbed in the new shower and all the sanitary ware, tested and regulated the water temperature and got the new shower room up and running, looking very nice indeed, before we started on the main bathroom.